Thinking about and recording emergency medical care choices is not about death. It is all about how you wish to be treated while you are alive. Someday, you may be brought to a hospital in critical condition. You may be confused or unable to answer questions that are asked of you. You are not dead and, in actuality (and hopefully), you might not die. If you are sedated and admitted to the hospital, how will the staff know who to contact and what you like or want? When I worked as a hospital chaplain, I cared for a young man who was in a coma. The nursing staff realized that he became agitated when the room was quiet. His family brought in music from several of his favorite recording artists. When the music was played, he rested peacefully. How did his family know what to do? He told them in advance. My point is that hospital or medical care is not just about physical care. It should and does include emotional and spiritual care as well as basic life preferences. This can even help when the situation is not as critical. For instance, my wife, Naomi, hates to sleep with the blankets tucked tightly around her feet. If something should happen to her, I want to make sure that she is as comfortable as possible. Because I know her wishes, I will be able to relay this to the nursing staff. While writing an Advance Directive is detailed and usually focuses mainly on end-of-life or death decisions, the following questions may help others care for you when you are critically ill.
What other kinds of non-medical information should the medical staff know about you? If I am admitted to the hospital or I am facing a long recuperation, either at home or in a rehabilitation facility, who would I want to be notified and wish to come visit? Is it okay to post information about my illness or injury on social media? Am I more afraid of being in pain or being drugged to the point of not being able to visit with people? Are there any particular foods that would make me happy (assuming that I have the approval of the doctor)? Do I prefer quiet in my room or do I want music? If music, what kind? If I am unable to read, would I like audiobooks or someone to read to me? If I am in a coma or drugged, do I want someone just to sit with me? Do I want my rabbi, priest or other spiritual leader to visit me? Do I want the person who makes decisions to be the Emergency Room doctor or would I rather have someone who knows me and knows what I want to make those decisions? If I have identified a person to speak on my behalf (medical power of attorney or agent), does he or she know what I want to happen if current treatment is not working? Remember, you may be healthy and active now, but don’t put off making some of these decisions today. Think of it like a health insurance policy. Hopefully you will never have to use it, but if you do, it is great to know it is available! Knowing what you want to happen is only the first step in the process. Writing your wishes down is the second. Telling someone whom you trust is essential. Mental clarity begins with having the space, time and freedom to focus on what’s important to you. Let’s start with what happens when you have a lack of organized space. Disorganization creates a feeling of being crowded and out of control of your things, which leads to lack of mental clarity. 1) Do you spend too much time looking for your stuff? 2) Do you feel like you are always in a rush? 3) Do you feel like your space does not support what you want to accomplish? If any of the these sound familiar, then imagine your work space right now. Perhaps it is your desk or another place where you do most of your mental work, you know, the stuff that you need to get done every day. Take a moment and imagine you sitting down, about to get to work on a big project. How do you feel about this space? Do you feel like it is inviting you in and you are excited to get your work done or are you repelled by what it looks like? A space that repels, doesn’t support you to do your best work. A space that is inviting creates calm and clarity and allows you to be productive. Creating an inviting, supportive space is different for each person. Yet, it comes down to the same thing for everyone. Choose to surround yourself with only things that you need and you love. That’s hard to do, because we all get attached to our stuff, however; when you create more space by having less stuff, you will feel more focused and in control. Our second area to consider is Time. While there is no end to the amount of information about how to manage time, I would strongly argue that it’s not about managing time, it’s about managing tasks. The difficulty comes from having too many tasks. Our plates are full with things to do all the time and this leads to brain fog, overwhelm and that feeling of being out of control. Have you had one of those crazy busy days; where you’re running around doing a hundred different tasks and spending half that time attempting to do more than one task at a time? This is how we fall into the fallacy of multi-tasking. By the end of the day, you end up feeling exhausted and wondering what you did all day. The solution is to create a system. And if you are rolling your eyes or shaking you head because you tried a system and it did not work, try again. 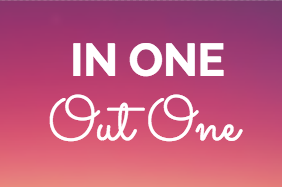 Systems are NOT a one-size fits all solution. You often have to try different ones and one of the keys is to know what does and does not work for you. You need a system customized for you according to how you think, live and work. Which brings us to Freedom. Ah, Freedom- even the word sounds nice. When you have too much stuff surrounding you or you have too much to think about, freedom is the last thing you have. Instead you experience confusion, chaos and a lack of control. None of us wants that in our lives. This is the opposite of freedom and definitely does not give us mental clarity. Mental clarity comes from creating a physical space that allows you to feel supported because you have surrounded yourself with stuff that you need and that brings you joy. Clarity comes from having a system to organize your tasks so you feel in control of how you spend your time. The knowledge that you are in control of your space and time creates FREEDOM. And at the end of the day, each of us wants the clarity and freedom to create the life and business that we truly want. It’s that time of year, friends, when one of the only two certain things in life looms large: taxes. As a kid, April 15 was a holiday in our house. It was the day my accountant mother could breathe again after over 3 long months of helping her clients. 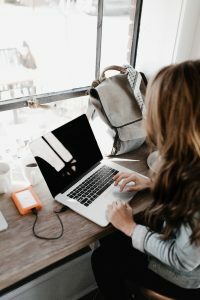 I may have learned a thing or two along the way, so I’m happy to share some tips on how to get organized before heading to your accountant’s office, or, if you’re one of those brave souls who tackles the task on your own, before you sit down at the kitchen table amid a sea of paperwork. In either case, the key is starting early… as in January 1 early. Taxes can get pretty complicated depending on what kind of return you have to file. Do you have a business? Dependents? Itemized deductions? There are already a lot of great sources of information out there about which documents and information you need to gather. Instead, let’s focus on how to move through this year proactively so that when April 2020 rolls around, you won’t be scrambling to find all this documentation. The first thing you should do is have a dedicated folder where you can file any paperwork that you may need come next April. Attach these lists to the front of each folder. Cross off items as they go into the folder. Things like property taxes may show up early in the year. Income statements start arriving in the mail or your inbox in January. Now that you’re filing, try to stay ahead of the record-keeping by doing it monthly. 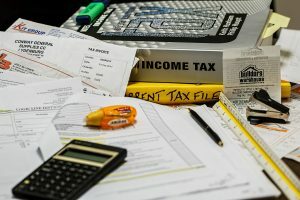 This effort will help both you and your accountant simplify the process come March or April, so you don’t have to scramble to collect all the information and dollar amounts in a last-minute rush. Pick your poison to start an electronic or written file for keeping records of expenses. I’m a lover of Excel, but some folks prefer Word or even handwritten lists. If you’re in the latter camp, I recommend buying a dedicated ledger book to record line items. Keep separate files for personal and business. Once a month, go through your saved receipts and enter them into your record. Remember to categorize the type of expense for each receipt. As you can see, it’s all about establishing a system that you can easily maintain throughout the year with minimal effort. It’s so easy to get behind with all the personal and professional obligations we balance. If we can stay aligned with the system and find an hour a month to maintain it, then when that April 15 holiday inevitably rolls around again, we can face it head-on with confidence and careful preparation. If you’ve ever wondered, do organizers really practice what they preach? 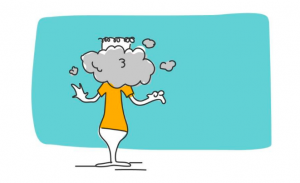 The third rule, In One/Out One, is the least appreciated and most neglected by our clients, even though it offers the best defense against clutter build-up. Here’s a personal story of how it recently went down in my house. First you have to know that I LOVE citrus. Fresh lemon juice goes into every salad dressing. Fresh lime juice refreshes most fruit bowls. Many of my fish recipes require fresh lemon, lime or orange juice. So my juicer has been a staple in my kitchen. 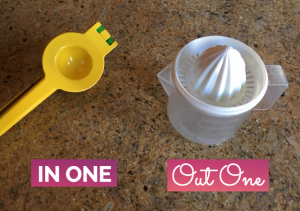 I love that it not only does a great job, it also attaches to a measuring cup – which makes it easy to know when I have enough. My husband, an aspiring minimalist, bought me a new juicer. He had researched to get me “the perfect gift.” I was skeptical, even though for him to buy something it MUST be great. I could not imagine HOW anything could replace my beloved juicer. Well, my new citrus press is all that AND bold and bright. In being so colorful — I smile every time I see it. But it took me some time to let go of my trusted fave…2 weeks, in fact. I call it the testing time. Some “old” items deserve this reflective time. 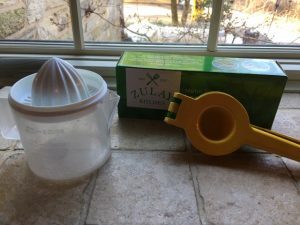 Honestly, it took me a week to open the package and try the new “citrus press.” I felt like I was cheating on my trusted go-to. Since I was using these gadgets daily, it didn’t take long to know I was in love. As for my “old” juicer, it still has life left in it. My son is a decent cook at college — so guess who just inherited a new fave? 🙂 When he graduates, I will gift him his very own citrus press! * Remember I said these were 4 rules that I think every Professional Organizer follows? It’s true of any organized person. • You don’t have to be a professional organizer to be organized. Yes…it’s true. Not every organizer is the MOST organized person you’ll ever meet. • Professional Organizers know how to help YOU solve your organizational overwhelms and clutter-crisis. My birthday is Ground Hog’s Eve (Feb 1st). That means I get a do-over for whatever New Year’s Resolutions I haven’t followed through with. I get to make new resolutions for what I want to change before my next birthday. But this year I decided not to make resolutions. I decided to set intentions instead. Resolutions too often include words like “don’t, won’t or never.” Intentions are focused on the future and can be stated in the present tense every day. After my morning meditation, I frequently set an intention to be grounded and focused throughout my day. Intentions can become habits. A habit is defined as “an addictive behavior that is hard to give up” but an addiction does not need to be viewed negatively. For example, I am addicted to my grandchildren. The more time I spend with them the more time I want to spend with them. What would happen if I became addicted to new habits? To become addicted, the first thing I need to do is to explore how I will benefit from my new habit. In sales, we are taught that when we convey the benefit first, ask key questions that lead our prospect to reply “yes” or to nod their head affirmatively, the close will take care of itself. In December I set an intention to allow more time to get places and not squeeze one more thing in before getting out the door. Then I decided I couldn’t wait until January to put this into action because rushing to get out the door was stressing me out and negatively affecting everyone around me. It isn’t an intention anymore; it’s a new habit. The benefit of allowing myself more time to get places and get out the door on time is that I don’t feel stressed about forgetting something important or anxious about being late. I am more grounded and focused throughout my day. Habits create different types of energy. Good habits create positive energy that flows. 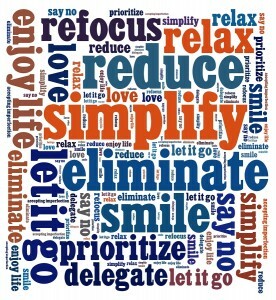 “Bad” habits create problems like clutter and disorganization; a stagnation of energy, productivity and efficiency. As a Home Organizer I look for the cause of the clutter and chaos in a space and often I see it is because of “bad” habits like not processing junk mail or not breaking down cardboard boxes when they are empty. When I am finished with a client, I make recommendations to help them to create new habits that will keep the clutter from re-accumulating and will maintain the serenity that organization has created. One of the biggest challenges in life is to walk your walk and talk your talk. I intend to do that starting now and not wait until New Year’s Eve or Ground Hog’s Eve. I am a parent of two older teens, one in the first year of college and one in the later years of high school. As an organizer, my kids grew up with structure and routine, in hopes of them learning to be organized as adults. Our home was organized, our mornings ran fairly smoothly, and homework was completed without any issues. There were a few sticky points, such as screen time and bed time, but for the most part, our daily lives ran smoothly overall. Now that they are older, the organizer mom in me still wants to help them be the most efficient they can be. But the cognitive side of my brain knows that now is the time to let go, and let them make their own decisions. I should only help them when they ask me for it. However, it is very difficult for me to sit back and watch them make mistakes such as scheduling two events for the same time, or running late for something. But I know the only way they will learn is by my stepping back and giving them the control to manage their own time, schedules, and things. They will make mistakes, and learn from them. As hard as this is for me to let things go, I am getting better at it. I still sometimes find myself jumping in when I shouldn’t, and they both let me know when I am intervening where I shouldn’t be. I just take note of this, and try to not make that mistake again in the future. I am sure I am not alone, being a parent during this transitional time. I wish all of you the inner strength and patience to step back, and let your teens develop into the wonderful young adults we all want them to be!